Boarding begins at 5 p.m. for this 2-hour (6 p.m. to 8 p.m.) happy hour cruise along New York Harbor. Beginning at Pier 15 at the East River Esplanade, head out onto the water as the sun sits low in the sky, casting long shadows across the entire New York City skyline. Be sure to being a camera to capture breathtaking views of landmark attractions like One World Trade Center’s Freedom Tower, the Empire State Building, the Chrysler Building, the Statue of Liberty, Ellis Island, the Brooklyn Bridge and more. Mingle with friends, family or co-workers, and depending on the type of cruise experience chosen, enjoy a selection og beer and wine or an unlimited premium open bar. Listen to live music, dance to an award-winning DJ or simply sit on one of the outer decks, drink in hand, taking in the view of the city as it lights up for the evening. 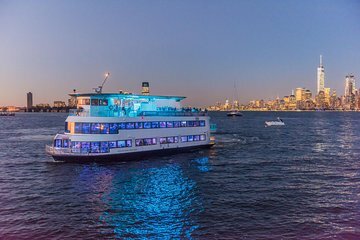 This happy hour cruise is great for fun of all kinds, including the traditional end of the work day mixer (must be 21 or older with valid ID to consume alcohol). Climb on board as part of a group celebration, a birthday party, a team-building activity, a private event or just another excuse to get out and about. This is a very nice way to experience the New York City skyline where you can see it both at sunset and at night. Not to mention the Statue of Liberty! It was very cold though! I brought 20 co-workers to the boat ride on a Friday night. Food was great,staff was efficient and pleasant. I highly recommend. A nice relaxing way to spend an evening or afternoon with friends and see NYC. Whether you are a tourist or a native new yorker. incredible tour! seeing the famous skyline from the water was breathtaking. anyone looking for something fun and different to do whilst not breaking the bank- this is the tour for you!!!!!! Spectacular views of New York Harbor, including an up-front and personal with the Statue of Liberty. Good music and dancing, reasonably priced dirinks for New York, fun-loving crowed. Amazing and highly recommended indeed!